Children will have lots of fun while learning important skills such as coordination, color matching and math skills! 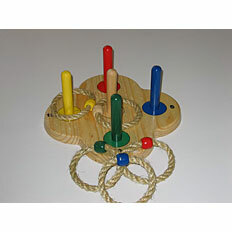 Tossing the sturdy twine rings onto their matching pegs makes this a real favorite among children. 11 ¼? hardwood base, 4 ½? colored pegs, Non-toxic paint.